CASA Ballarat is a beautifully restored 1920's Spanish mission style home located centrally in Ballarat. The house has been extensively renovated and extended to provide all the luxury mod-cons whilst paying homage to its beautiful Spanish Mission heritage. The property is located within walking distance to the CBD, Sturt Street, Cafe's and Restaurant's, the Arts and Theatre Precinct, Lake Wendouree, Ballarat Hospital & Cancer Care Unit and Ballarat Central Train Station. The front of Casa Ballarat retains it's original charm and includes an inviting entry and vestibule, 4 bedrooms, a modern bathroom with soaking bath and separate powder room. The modern extension at the rear is the main living and entertaining zone. A large open plan kitchen has an over-sized preparation bench that is the heart of the house. It overlooks the generous dining table and living room with wood fired heater. There is an additional bathroom, also with soaking bath, separate power room and study nook. The Laundry/ mudroom facilities are located at the back of the house, along with a double lock up garage with direct access through the butler's pantry. There are two outdoor entertaining areas. One has large dining table and sparkling festoon lights for an evening under the stars, the other perfect for a cuppa basking in the morning sun. Casa Ballarat is a pet friendly home. Bedrooms 1 and 2 have Queen Size Sealy Posturpedic Beds to help you get a good night's sleep. Quality pillows, electric blanket, luxurious sheets and Australian Lambs wool Quilts ensure your home comforts are with you. There are also built in robes with ample hanging and drawer space. Each bedroom also has an Alarm Clock with Bluetooth Speaker and Mobile Device Charging Ports (Please note Mobile Device Charging Cables are not supplied - BYO). Bedroom 3 has 2 Sealy Posturpedic Single Beds and topped with electric blankets, quality pillows and sheets and Australian Lambs Wool Quilts. There is built in robe and alarm clock. This is a generous bedroom featuring 2 sets of Bunk Beds sleeping 4 with super comfy mattresses. Cosy Australian Woollen Quilts and luxe Memory Foam Pillows make for a wonderful nights sleep. There is also a 40" Sony TV and Radio/ Bluetooth Speaker. The sleeping zone's bathroom has a separate shower and standalone bath maintained by an instant hot water service that won't run out. Quality Australian Organic Shampoo and Conditioner, and Body Wash is supplied. Like the sleeping zone, bathroom 2 has a separate shower and bath. Quality Australian Organic Shampoo and Conditioner, and Body Wash is supplied. The kitchen is well stocked for the avid entertainer. There is a large double door fridge-freezer, 5 burner gas hob, electric oven and dishwasher. Preparation is a breeze with generous range of tools and utensils. There is ample glassware, crockery, cutlery and serving platters too. A comprehensive range of cookware is also supplied. Other appliances supplied include: Food processor, electric pressure cooker, kettle, toaster, jaffle maker, soup maker, microwave oven, and pizza stone. Basic pantry items are supplied but not regularly restocked. Please feel free to donate any left over pantry items for the next guests to use. An over-sized dining table for 8 guests is great for a family and/or friends get-together. You can also huddle around the cosy wood-fired heater in winter while you watch TV on the 48" TV. A Blue-ray player and Netflix provide ample viewing choices (did I mention unlimited 80-100Mbps Wi-Fi is included!). There is also a Bose sound system. The living area has a large reverse-cycle split-system air conditioner and ceiling fans to keep the space cool in summer. The main outdoor entertaining area is accessible via double glass doors from the living room. This area is gated from front and back. Festoon lights sparkle overhead and are a perfect setting for a romantic evening laying back in outdoor bean bags under the stars. The second outdoor area has a small seated area making it great to read the morning paper over a coffee. The gas BBQ is also located in this space. The front loading Miele washing machine services the laundry space/mud room. The indoor area is strictly non-smoking. Please smoke outdoor and away from open doors. Always dispose of the ash and butts in an environmentally friendly manner. Please respect neighbours and keep noise to an acceptable level after 11pm. The house is heated by a gas-ducted system. We ask that you to respect the environment and turn off heating while out of the house and while the house is sleeping. A well stoked fire-heater will keep the chill off the air during those chilly Ballarat evenings. The beds also have electric blankets to keep you warm and cosy! Smoke and Carbon Monoxide Detectors fitted. Other safety - fire extinguisher and fire blanket. Property also has 2 Powder Rooms. Where do I start about beautiful Casa Da Familia? From the moment we arrived you felt so at home. Everything you could ask for is provided. Alastair and Glen were fantastic to deal with. Nothing was a problem. The kitchen has everything that you could imagine. The house is furnished so tastefully and the bedrooms were so comfortable. You are close to everything within walking distance of the beautiful city of Ballarat. We had 18 nights in this beautiful house and were sad to be going home. We look so forward to visiting next year. We thoroughly recommend this property. Michele, Tony and Ralph the Labrador. Loved our stay at this beautiful, well stocked and well located Ballarat property. Alistair and Glen could not have been more helpful, even concerned that we arrived safely after travelling late at night. Would have loved to stay longer. 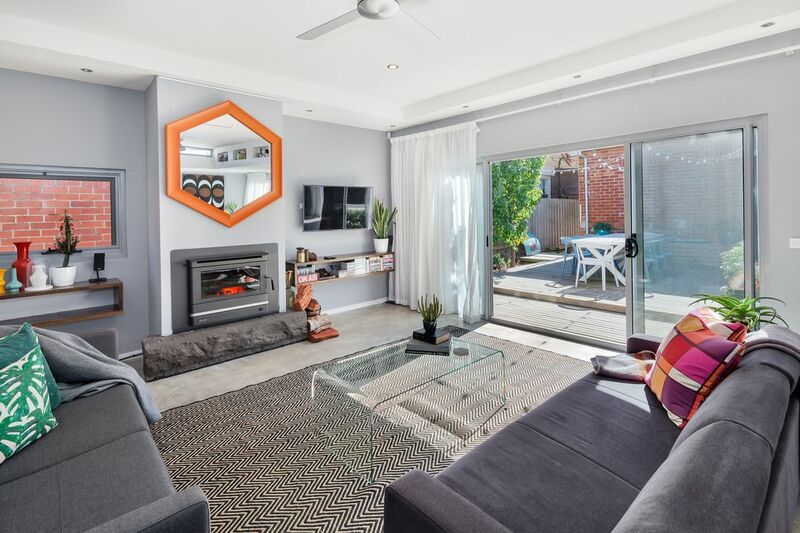 There's so much to do in Ballarat and the beautifully renovated home is within easy walking distance to the centre of town. We required a house for 6 adults and a baby, for 5 nights, as we were from Perth and attending a family wedding. Wow did we get everything we needed and more. The house was amazing with loads of room and so central to all the great coffee shops and restaurants. Alastair's recommendations of coffee shops and restaurants were all tried and were perfect. Our little baby was catered for with a port-a-cot and fan for the bedroom.